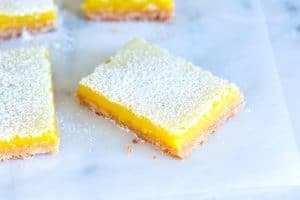 My favorite lemon bars recipe! These classic lemon bars have a crisp shortbread crust and a creamy delicious tart lemon topping. These bars need to be made in your kitchen, ASAP. 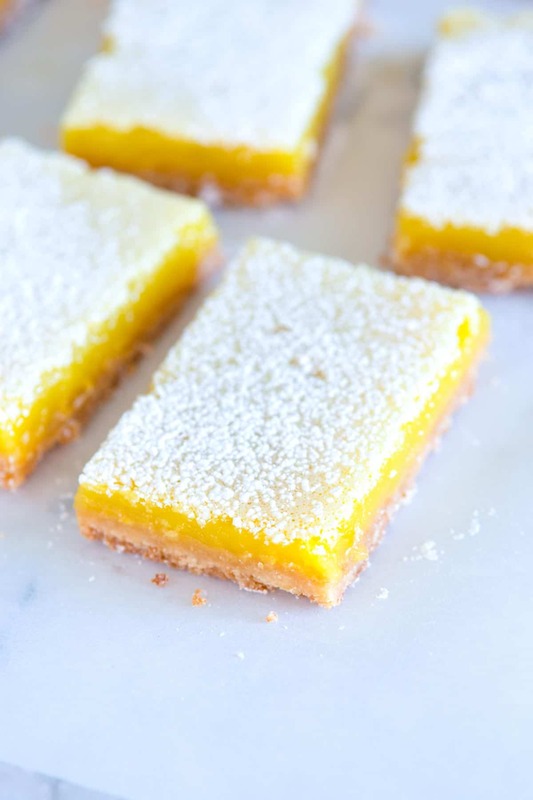 Jump to the Lemon Bars Recipe or read on to see our tips for making them. I’m not sure it’s possible to convey how much I love these easy lemon bars. Let’s start with the crust. If you’ve had shortbread cookies before, then the crust for our lemon bar recipe will remind you of them. I love it so much, I’d be happy to just eat the crust (it’s that good). Butter makes the crust of these lemon bars taste amazing. Sugar is used in the crust and lemon topping. I use regular granulated sugar. Lemons are essential (obviously), but for the best lemon bars, I like to use both fresh lemon juice and zested lemon peel for double the lemon flavor. Vanilla and Salt add flavor and help to make the filling and crust taste incredible. Eggs provide the base for our filling. We use four large eggs. Add extra flavor to the crust. Mixing the sugar in the crust with lemon zest, vanilla extract and a tiny pop of salt makes the crust delicious enough to stand on its own and even more wonderful with the lemon topping. Make flavored sugar by rubbing or pressing lemon zest, vanilla, and salt into the sugar. Use melted butter, not softened butter. 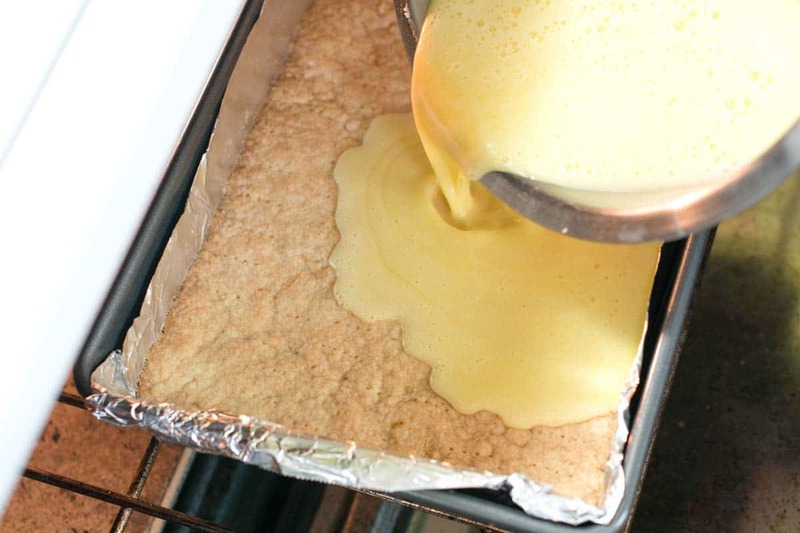 The crust in most lemon bars usually starts with creaming or rubbing softened butter with a mixture of flour and sugar. Instead of softened butter, I prefer to use melted butter. Making the crust with melted butter rather than softened keeps it crisp and perfectly contrasted to the creamy, lemon filling on top. Melted butter makes the texture amazing and bonus, it makes the bars easier to make. Melted butter makes the lemon bars crust better. Chill the crust before baking. Just like when we make pie crust, we’ve found that chilling the crust until firm (about 5 minutes in the freezer) helps achieve the best texture. Instead of puffing up and then shrinking in the pan, a chilled crust crisps, browns and becomes perfectly crunchy. 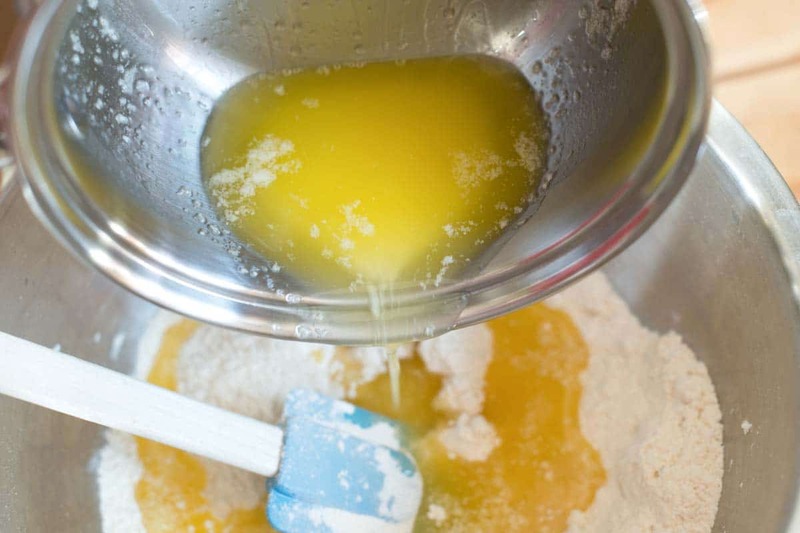 It’s also a good idea to prick the bottom of the crust all over with a fork before baking — this also helps to prevent the dough from puffing up then shrinking. Instead of puffing up and then shrinking in the pan, a chilled crust crisps, browns and becomes perfectly crunchy. Taste the lemons for sourness. We love a tart lemon bar, but do think you can overdo it. Lemons vary in how sour they are, so go ahead and taste the lemons before using them. If we notice our lemons are unusually sour, we’ll add a bit more sugar to the filling. If they are on the sweeter side, we’ll pull back the sugar a little. Since we love lemon bars so much, we will sometimes make a batch for just the two of us. To keep the extra bars fresh, we keep the baked and cut bars in the refrigerator. They last up to 4 days that way. I also love these easy Blueberry Lemon Cheesecake Bars with a graham cracker crust, lemon cheesecake topping, and blueberries. 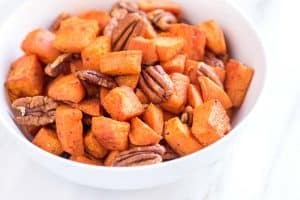 Our Favorite Carrot Cake Recipe – An incredibly moist and light carrot cake recipe with extra simple cream cheese frosting. Simple Apple Tart – A simple and rustic apple tart recipe with a buttery crust, thinly sliced apples, and toasted almonds. Peach Cobbler Recipe – Simple peach cobbler recipe with a lightly spiced peach filling and sweet biscuit top. Perfect with fresh or frozen peaches. These easy lemon bars have the most delicious buttery crust and a creamy, tart lemon topping. Making the crust with melted butter rather than softened keeps it crisp and perfectly contrasted to the creamy, lemon filling on top. Don’t skip chilling the crust before baking, it really helps keep the crust crisp and crunchy. Lemons can vary when it comes to how sour they are. We like to taste our lemons to check for sourness. If they are really sour, we might consider adding a little extra sugar to the filling. Alternatively, if they are sweeter than usual, we’ll pull back the sugar amount (2 to 4 tablespoons should do it). Line a straight-sided 13 x 9-inch metal baking pan with foil, leaving an overhang on two opposite sides. (This will help when it comes to removing the cooled bars from the pan). Lightly coat the sides of the foil, but not the bottom, with non-stick cooking spray or extra melted butter to prevent the lemon topping from sticking. 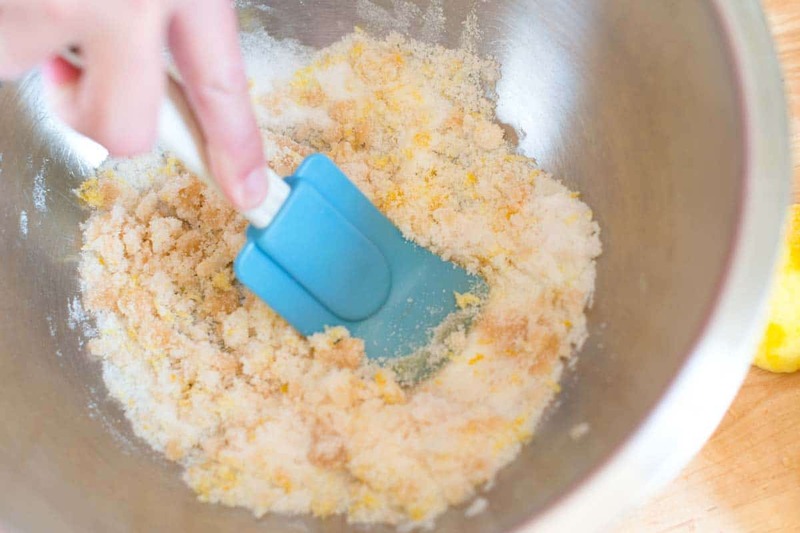 In a medium bowl, use a spatula to stir and press the sugar, salt, lemon zest, and the vanilla extract together until it looks moist and is fragrant. 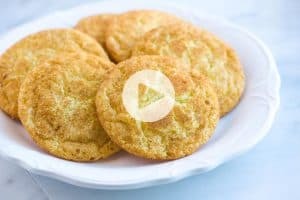 Stir in the flour and melted butter until a crumbly, stiff dough forms. Press the dough evenly into the bottom of the prepared baking pan (it may not look like enough dough at first, but it will cover the bottom nicely). Prick the dough with a fork all over to prevent air bubbles while baking. Freeze dough for 5 minutes, or until firm (or refrigerate for 30 minutes). Position an oven rack near the center of the oven and heat the oven to 325 degrees F. Bake the crust until lightly golden brown and set, 25 to 30 minutes. While the crust bakes, stir the sugar, flour, salt and lemon zest together. Whisk in the eggs until smooth then whisk in the lemon juice. Once the crust has baked, pour the lemon topping over the hot crust. Return the pan to the oven and increase the oven temperature to 350 degrees Fahrenheit. Bake until the topping is set in the center and it no longer wiggles when the pan is moved, 20 to 25 minutes. Set the pan on a cooling rack and cool until the lemon bars are firm and the bottom of the pan is no longer warm, about 1 hour. (You can speed this up a little by placing the bars into the refrigerator once the pan is no longer hot). Once cooled, use the overhang of foil to carefully lift the bars from the pan and place on a cutting board. Peel away the foil then cut into 16 bars or 32 small bars. Sift the powdered sugar over the bars. Storing: If stored in the refrigerator, the bars should keep up to 4 days. Lemon Zest: We use a rasp-style grater or microplane for the lemon zest. You’ll want to zest the lemons before juicing. We call for 3 teaspoons in this recipe. Two lemons should do it. Crust recipe inspired from Fine Cooking’s shortbread crust. Delicious. First time making. Bringing to a potluck tomorrow. Wanted to bring a dessert that wasn’t chocolate. Thank you for posting. Yum! These are AMAZING😍everyone loved them! They were all fighting over who got to take tje leftovers home🙈a lot of people always comment on how good the lemon filling is, which this is fantastic BUT the crust for this is PERFECT!! You could honestly eat it on its own! BEST lemon bar recipe ever!!!!! By far the best lemon bars I have ever tasted; homemade or pastry shop made!! First day , I did them and they were delicious . Let them in refrigerator and the second day they were even better… I eat them all. Very simple recipe . The crust is so good the filling is so smooth. It will be my recipe to use for lemon bars , from now on will be on my 10 best recipes list . Made these for a Super Bowl party with lemons from our tree – filling was perfect & tangy with idiot-proof consistency. Crust was the right sweetness & great flavor but a little TOO crunchy for me — I’ll try it next time perhaps pulling shortbread from oven a little earlier than “golden brown.” But it’s a keeper for the perfect filling flavor/ consistency regardless. Thanks so much for sharing this recipe! I made some a few days ago and they were delicious! Perfect combo of a tart and creamy lemon top and a sweet and crunchy crust. Do you think this could also be made with mangoes? Hi Shanese, Thanks for the comment and your photos looked great! As for using mango, I’m really not sure since I have never tried this. I bet something could be worked out though! That’s great to read, Shanese. Wow! I have been searching for a creamy scrambled egg recipe and I’ve found the absolute best in your recipe! I’ve done a lot of trial and error through books and other resources and truly…yours is a winner! I look forward to making these for my family! I am confident they will love them! One question, if I wanted to add cheese, when is the best time to add it so the cheese doesn’t clump in the eggs? Thank you again and keep up the awesome work! Looking forward to trying your potato salad next! Very Yummy! Honestly I could have eaten the crust all by itself. I think because of the sweet filling, the crust could use a little less sugar and would probably taste great without any. It was very lemony and would be a great dessert for those who like tart sweets. I will definitely be making this again for my Grandma who loves tart! Parchment will work just fine. Just made these tonight. Fantastic! I made the recipe, and it was great… This is the first time I baked lemon bars from the scratch… the lemon filling and crust fits perfectly together. Everyone in the family loved it. Thank you for this yummy recipe.Giving 5 stars for this. Just made these for my grandmother for her birthday and they were amazing!! I hunted for a while online to find a recipe that had more of a creamy rather than cakey filling and this was it. I was so focused on finding the right filling that I wasn’t concerned about the crust but wow, the crust was absolutely delicious, too. Great recipe, full 5 stars!! I made your lemon blueberries bars and they are the best. I didn’t change a thing at all. They were made for the Fourth of July and everyone loved them. Again thank you for the great recipes. Just found your web sight and let me tell you your recipes look great. Trying the lemon bars today. I will tell you how they turn out. Again thank you for the great recipes. I can give it five stars just lookin and reading your recipes. I’m making these now, I didn’t have enough lemon juice so I added a little lime with it. Tasted it before I put the eggs in and it was great. Perfect combo of tart and sweet. Thanx guys!!! My wife and I just finished making tahini and are about to make hummus. We can’t get lemons here so using small limes. I hope to make these lemon bard tomorrow, but will substitute passionfruit juice for the lemons. I really enjoy these recipes. Simple, with some good tips and minor changes from what I’m used to seeing. This recipe looks perfect.